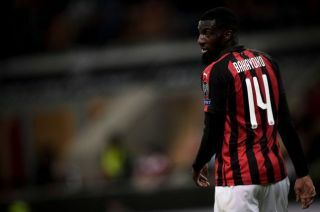 After struggling in the early part of his loan spell at AC Milan, Chelsea midfielder Tiemoue Bakayoko has gone from strength to strength under Gennaro Gattuso. The 24-year-old was seemingly set to see his struggles continue after a disappointing campaign with the Blues last season, as he even received jeers from Milan fans for his early performances. However, he has now turned a corner as aside from offering defensive protection in front of the backline, his athleticism and dynamism in midfield has also allowed him to play a key attacking role for the Rossoneri too. In turn, he has received three consecutive Man of the Match awards from various outlets, with Calciomercato noting that his most recent outing against Parma on Sunday saw him score highly with all the main newspapers in Italy to prove that he certainly is moving in the right direction. As noted by Goal.com, Milan will have a €35m option to make his loan deal a permanent move in the summer, and so if he continues this run of form, it could make their decision easy come the end of the season. Chelsea fans though may be left to rue their handling of the French international, with some seen below reacting to his recent form on Twitter and commending him for the ‘turnaround’ that he has experienced. Time will tell if circumstances arise in which Milan don’t exercise their option, but it remains to be seen if Bakayoko could then force his way into Maurizio Sarri’s plans. Ultimately, it doesn’t seem likely though as he doesn’t fit the style of play that the Italian tactician has implemented since his arrival at Stamford Bridge. “Present everywhere. 27 challenges won, between recoveries and interceptions,’ La Gazzetta dello Sport wrote of his performance at the weekend, Bakayoko has seemingly won over his detractors in Italy. Chelsea handled Bakayoko’s development extremely poorly. Sold Matic too soon (no mentorship) which threw him straight into the team to be relied on to deliver at a high level from day one. Tiemoue Bakayoko has collected three ‘Man of the Match’ awards in AC Milan’s last three matches. Turnaround ? Happy for Bakayoko. Man has suffered enough.